Theresa May, prime minister of the United Kingdom, says Nigeria is home to the highest number of “very poor people” in the world. Speaking in Cape Town, South Africa, on Tuesday, May said Africa is home to a majority of the world’s fragile states, and a quarter of the world’s displaced people. She added that Africa has the highest number of poor people in the world, stating that 87 million Nigerians were living below the poverty line of $1 and 90 cents per day. “Much of Nigeria is thriving, with many individuals enjoying the fruits of a resurgent economy, yet 87 million Nigerians live below $1 and 90 cents a day, making it home to more very poor people than any other nation in the world,” the UK prime minister said. In June, the Brookings Institution named Nigeria the poverty capital of the world, overtaking India, a country with a total population of over 1.3 billion people. At the time, the Nigerian government said Nigerians should dismiss the report, considering the fact that it was compiled when the country was in the throes of its worst economic recession in 29 years. May said achieving inclusive growth is a challenge across the world, adding that Africa needs to create 50,000 new jobs per day to keep employment rate at its current level till 2035. 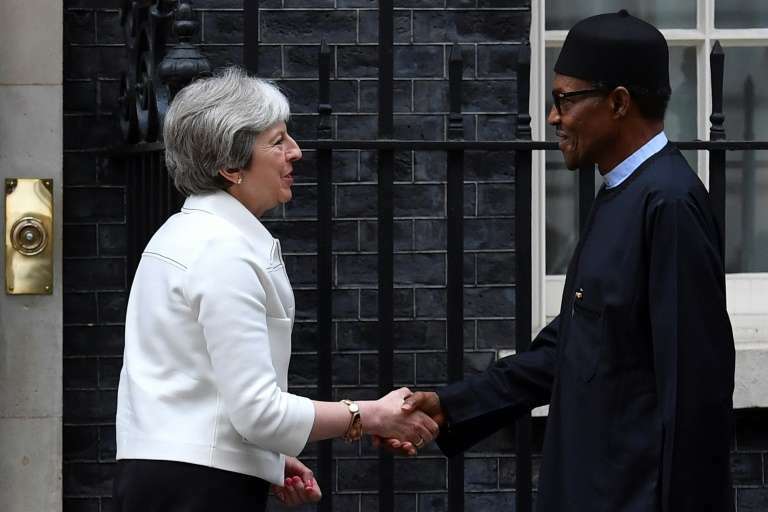 The prime minister said she wants the UK to become the biggest G-7 investor in Africa by 2022, building around shared prosperity and shared security. “I am unashamed about the need to ensure that our aid program works for the UK,” May said, adding that a healthy African economy is good news for the UK. “It is in the world’s interest to see that those jobs are created, to tackle the causes and symptoms of extremism and instability, to deal with migration flows and to encourage clean growth,” she added. The 61-year-old said the UK is planning to sign a deal with Kenya to ensure the repatriation of stolen Kenyan funds stuck in the UK. The UK has one of the biggest overseas aid programmes in the world, expending $18 billion in 2017 alone. May will be visiting Nigeria later this week.